added 9:57am, Cap hit information below regarding the Wings/Zetterberg. Zetterberg has 3 years remaining on his contract with an annual cap hit of $6,083,333. Knew it, but seeing it is a gut-punch. Khan also tweeted saying Abdelkader back home, wife expecting a child. Holland tells the media Z will go on LTIR. Good for him to prioritize his current and future health over money. You had a great career, Zetterman, walk away while you still can with your head held high. Major news like this doesn’t just impact one team. This is one of the NHL’s stars. He wasn’t Pavel Datsyuk flashy. He wasn’t Nicklas Lidstrom worshipped. But when the best players around the league competed against Henrik Zetterberg, they knew what they were in for. And they respected him immensely for him. Holland: He’s got a degenerative condition in his back. Part of the degenerative condition is significant arthritis. Nothing can be done, no back surgery, no rehab, no more time off is going to have any positive impact. Thanks, Z, you were all heart and a true Red Wing! Good for him to prioritize his current and future health over money. He’s going on LTIR, not retiring, so he’s still going to get paid. Henrik Zetterberg is ending his career. Zetterberg saw a specialist in New York last week and found he had a degenerative back condition. Rather than assuming any further risk and affecting his quality of life, he announced on Friday morning at Wings’ training camp in Traverse City that he has decided to not play. “He’s made a decision he’s not prepared to take the risk to play professional hockey anymore,” Wings general manager Ken Holland said. “He’s got a degenerative condition in his back. Part of the degenerative condition in his back is arthritis. Nothing can be done, no back surgery, no rebab, no more time off is going to have any positive impact, and if he were to play professional hockey, it’s going to accelerate the degeneration. Thanks for giving everything Hank. Ugh. Knew this day was coming and am happy for him. The fact that he played 82 games for each of the last 3 years is amazing and a testament to his commitment to his leadership of this franchise. He’ll be missed for many things but it is time. Once Kronwall goes, and I mean that literally, not figuratively, the last link to the last great Red Wings teams will be gone. I’m not saying we’re facing a nuclear winter, but it’s going to be awhile before you can put the words “Detroit” and “Stanley Cup” in the same sentence. Abby, Helm, and Howard played in 08, but you’re right about the primary guys winning that Cup. Saw this coming, most of us did of course. But you guys are right it was still a gut punch to see that notification from The Score app come across my phone while at the store this morning. Because now it’s real. And Paul, this is one of those times where the DET news should also be on the KK Hockey section as well IMO. 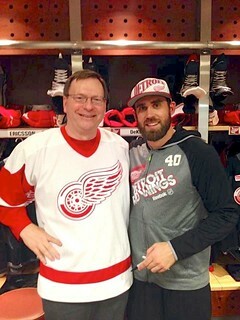 P- I will be posting the Zetterberg news in KKH too from a general point of view. The good thing is A2Y does hit the KK homepage and also Twitter and Facebook. Sad indeed. I had hoped the media speculation over the summer was just that…bored media in the summer looking for stories, like they had the last couple summers. It’s almost the end of an era, and it’s going to be a while until the next one. While there are exciting new players in the pipeline, I still had attachment to Z, Kronwall, and Datsyuk because I had such fond members of those teams - elite, exciting, and fun teams. The league has changed so much in the last 10 years…we may not see many high performing teams like the ones we had when those guys were still on it. It’s just not going to be the same watching this club - at least not for a long time. Sad, but we knew it was coming. I have arthritis in my neck. I can only imagine how it affects your back. So long Z. Thanks for every time you stepped oot on the ice. All the best to you, and, yours. Seriously though … a real warrior. Sad news. Could someone please explain going on LTIR versus retiring? Is the cap hit the same and/or is it likely that we’ll just dump his contract on another team like we did when we traded Datsyuk? No expert here TH, but if he retires, he forfeits his remaining salary. Zetterberg was one of my favorite players, just GD warrior, leader, a competitor, every time he jumped over the boards, he competed against every player that stacked against him, no matter size or skill, he just gave it everything he had. To me this marks the absolute end of an era of true Red Wing Warriors. Hopefully enough rubbed off on these kids. If he retires, he loses the rest of the money ($3.5M, $1M, $1M, if I remember correctly) and Det cap hit is the amount they saved on cap in previous years, so something like $2.5, $5, $5. If he goes as injured, he gets his money, his cap hit is $6M, but he can be put on LTIR, so if it’s in pre-season, Det can spend up to $6M more, or if it’s after the start of the season, Det can trade for up to $6M more. if you start the season with people on LTIR, your starting cap hit is your cap for the season, except if everybody gets back from LTIR, when it reverts back to max cap. So, if Det starts with current salary structure ($83M), and with Franzen and Zetterberg on LTIR ($4M + $6M), their max cap for the season is $73M and they can’t even call up a rookie if someone goes onto IR (if someone goes onto LTIR, they can spend up to his cap hit). If they start the season with Franzen on LTIR and transfer Zetterberg onto LTIR after the start of the season, they will have $6M space. Is it even legal for them to start the season with Zetterberg on the roster and then put him on LTIR after the season starts? Bummer. There goes the best beard in hockey – and the chance for the “kids” to learn firsthand what it takes to give 100% all game, every game. That loss is bigger than any goals and assists they’ll lose without him in the lineup. I’m not 100% sure,but I think the requirement is to put the player on the IR, and team can decide to slide him on the LTIR depending on its needs. IR means he is off 23-men roster, you can put in the replacement. LTIR means that you also get his cap space for as long as he is injured.